Child $35.00: Ages 6 - 11. Must be at least 6 to attend this tour. 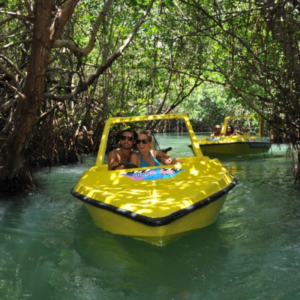 What would be better than speeding around mangroves and lagoons with the fresh air blowing in your face? 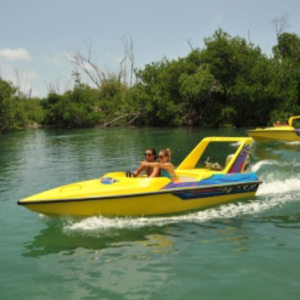 Speeding around mangroves and lagoons in Cancun with a loved one or friend! 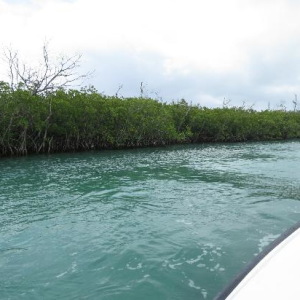 Our Cancun Jungle Boat tour is one of the most popular tours in Cancun, and it’s guaranteed to blow you away. 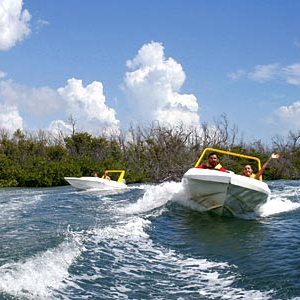 Enjoy driving the boat along the gorgeous Nichupte Lagoon, and through dense mangrove channels. Discover incredible marine wildlife in their natural surroundings from your two person adventure boat that allows you get up close and personal with the sea life. Therefore, we strongly advise you to bring a camera! After the mangrove tour you will snorkel in the second largest barrier reef in the world. 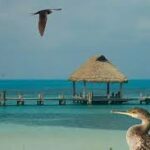 On your snorkel tour you will see many of the underwater species that inhabit this portion of the Caribbean Sea including; Barracudas, Manta rays and some of the most colorful reef fish in the world. Unlike scuba diving you do not need special qualifications or expensive equipment to snorkel; just simply clip on a mask, a snorkel tube, a life jacket, some fins and you are good to go! Our snorkel guides are designed for comfort, fun, and above all a safe experience. This is the perfect way to end the trip, giving you the chance to relax within nature and is a great experience to share with friends and family. 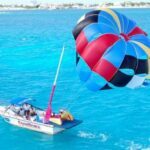 Come join us on this unique experience and discover the natural beauty of this gorgeous part of Cancun. Boat type: Speed Boat with outboard motor, steering wheel, and automatic transmission lever. It also has a storage compartment for snorkeling equipment. Tour operates Daily, Departures at 9 a.m., 12:00 p.m., and 2:30 p.m.
Tour starts at the dock location specified in your confirmation.